In this picture are various friction powered, wind-up, and battery operated vehicles with dogs. 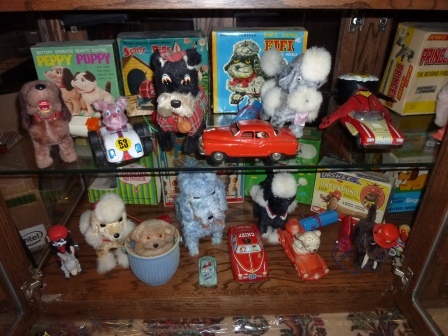 Also shown are several antique battery operated stuffed dogs. Many of the dogs are animated, with moving features; some of the early European items feature small bellows that allow the dog to “bark”. Some of the later models are even powered by a remote control. Any dog lover or toy collector will not want to miss out on this collection at DFW Elite Toy Museum.